This is a limited opportunity and initially we are only looking for 1 instructor to join us in the Lewes area. Could that person be you? If you are interested in joining us and setting up your own franchised business contact David now via email at Medusamail@virginmedia.com or use the contact form below. Please include your contact details and some background information about yourself. You will then be contacted for more information. 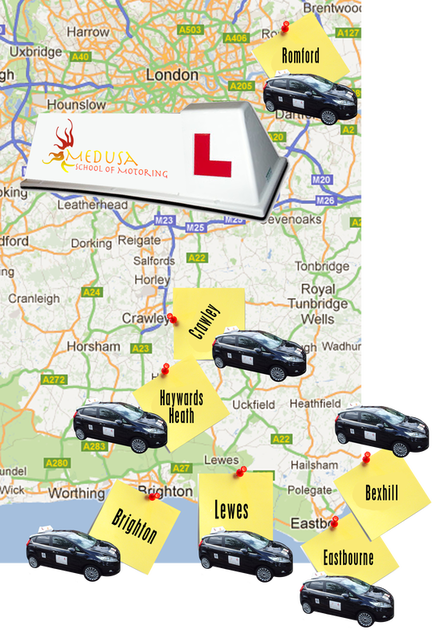 If you are already with another Driving School and looking for a change or you run your own local independent school and would like to supplement your pupil base we would still be interested. We do not penalize instructors for getting their own pupils. All we ask is that you display our headboard when you teach our pupils and stick to our lesson price structure for our students. Due to the ongoing success of Medusa School of Motoring, we are now offering exciting new driving school franchise opportunities. We are looking to expand our operation to incorporate the above areas in order to fulfill demand and increase our presence in the those areas. If you are a qualified ADI with your own/leased car and you are looking for a new and exciting driving school franchise opportunity, you have come to the right place. We will supply you with new pupils, access to our online booking and diary system and a headboard for your tuition vehicle. We will also include your franchised business in our marketing strategy. We currently have a fantastic franchise fee structure designed to help you get work as quickly as possible without the worry of having to pay franchise fees upfront. As a special offer and to welcome you as a new Medusa Driving Instructor we will reduce the initial franchise fee to just £50 per month, which will help you until you get enough pupils on-board to sustain the normal monthly franchise. The normal monthly franchise fee is £50 per week and is payable calendar monthly. This is equal to £216.66 per month. You will also benefit from 1 free week during Christmas and 1 extra free week per annum of your choosing. The graduated pay scale above will enable you to build up a portfolio of pupils without the worry of meeting high costs which are associated with other driving schools. You can also be assured that if at anytime you are not happy, you can cancel your agreement with only a 30 day notice period.